This medical plant comes from Madagascar and can be found up to an altitude of 100 m above sea level. Grows wild in the woods and in fields, or planted as an ornamental plant in the fence, and plant as a medicinal plant. Many branched shrub, 1-2 m high, spiny, woody stems, dark brown color. Single leaf, where the line of sight, short-stemmed, at the base of the stalk there is a pair of strong spines and sharp red purple. Leaf blade lanceolate, 4-8 cm long, 1-2 cm wide, tip pointed, base narrowed, the edge of the flat, smooth white-haired, green glossy leaves, mom pertulangan parallel to the bone in the middle of the yellow leaf. Golden yellow flowers, gathered in the form of grains out at the end of the rod. Fruit square, round, green. Seeds flat round, blackish brown. 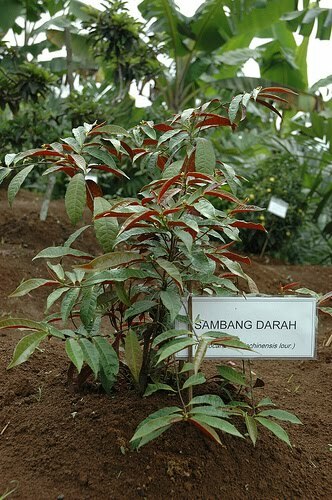 Propagation of this medical plant by stem cuttings. Fresh Leaves medical plant landik of of 6 - 1 0 g boiled, and drunk. For external use only, finely ground fresh leaves, and then paste it into the sore spot.